Social psychology is a specific part of the Psychology. It refers to the scientific study of the human thoughts and thinking procedure, feelings, behaviors as influenced by the real or imagined presence of the other. Here ‘scientific’ refers to the ‘emperical’ study of the human mind. This shows the impact of the society upon us which results in our actions and behavioral patterns. Social psychologists therefore deal with the facts that condition our behavior in a particular way in presence of the others. As it’s obvious it bridges the gap between the psychology and sociology which began immediately after the World War II. The two most prominent kinds of participants are the European social psychologists and the American ones. American focused mainly on the individuals while the Europeans opted for the group level. This is no doubt a complex subject which needs detailed attention. Urgenthomework.com offers online service regarding the Social psychology assignment help to the needy ones. Even though there were some really old concepts about social psychology like that of the Islamic philosopher Al-Farabi, the discipline began to emerge during the 20th century in the USA. Norman Triplett in 1898 first published a study on the phenomenon of ‘Social Facilitation’. During the 1930s, Gestalt psychologists, especially Kurt Lewin managed to run away from Nazi occupied Germany to the USA. These psychologists were instrumental in distinguishing the concept from that of the Behavioral and Psychoanalytic schools. The most popular phenomena were the theories of Perception, Cognition, Attitudes and so on. After the World War, they became interested in more recent phenomena like Gender issues, Racial prejudices, Shock experiments, Cognitive Dissonance, Bystander Intervention, Aggression and so on. They have sufficiently contributed in Health, Environmental, Legal psychology and so on. Some of the famous experiments regarding this issue are ‘The Asch Conformity Experience’, Muzafer Sherif’s ‘Robber’s Cave Experiment’, the ‘Milgram Experiment’ and so on. In order to know about these issues students should seek online Social Psychology Homework help. While working on an assignment students have to perform many duties simultaneously which include choosing the topics, searching the ideas, finding out books or journals about those topics, checking for online resources, organizing the points and gaining an outlook and finally making a draft of the assignment. All of these include heavy work and detailed attention which sometime can be problematic for the students. It’s not an easy subject to understand first of all. Therefore the assignments are needed to be finished within the deadline. This is why the students should seek online help. 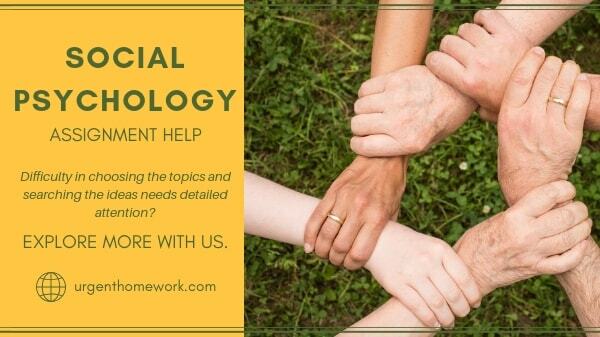 Urgenthomework.com is willing to offer its online help regarding the assignments of Social Psychology. Since the procedure will be conducted by the experts, the assignments will be well-researched, well-written and plagiarism free. They can be contacted through 24*7 live chat system and emails.